Fibre Systems is a trusted information source for the optical communications industry, aimed at component and subsystem vendors; network equipment manufacturers; planners, installers, and systems integrators; as well as operators and end users of fibre-optic networks worldwide. 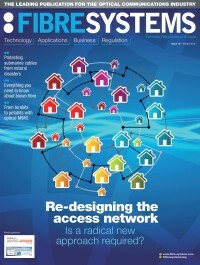 Fibre Systems comprises a quarterly print and digital magazine, a regularly updated website www.fibre-systems.com, and a monthly email newsletter, FS Newsline. Building on the success of its predecessor, Fibre Systems Europe (acquired by Europa Science in 2010), Fibre Systems has quickly re-established close working relationships with major events, such as OFC, FTTH Conference, ECOC, WDM and Angacom. 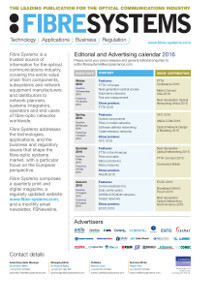 Fibre Systems is published four times a year (January, March, June and September) to coincide with major industry events, and is available for free to qualifying individuals in either print or digital format. Marketing options include display advertising, outserts, and inserts, as well as enhancements to the digital version, such as video overlay. As well as showcasing features from the magazine, the website, www.fibre-systems.com, contains pages of web-exclusive news, products, white papers, analysis and opinion, case studies, event previews and webcasts. Alongside traditional banner advertising, marketing options include white papers, sponsored content, and webcasts. There are two regular email newsletters: FSNewsline, a monthly round-up of the latest news, event previews and more; and FSProductline, showcasing the latest in new technology. Marketing options include banner advertising, sponsored content, and product showcases.